The William Street 47- 038 was built by FBM Ltd of Cowes at a cost of £560,000. She arrived at Fleetwood at 6pm on Wednesday October 4th 1989. She is powered by two 500 horse power diesels giving a top speed of 18 knots in any sea state. After a period of intensive crew training she was placed on service at 2pm on October 15th. She has a steel hull 47feet long and although primarily designed to be launched from a slipway, the William Street is moored afloat in the pen at Fleetwood. She has a crew of 6. The superstructure is made of aluminum, which reduces weight and gives a low center of gravity – which helps her self-righting capability. She has only just recently returned following an overhaul at Holyhead. 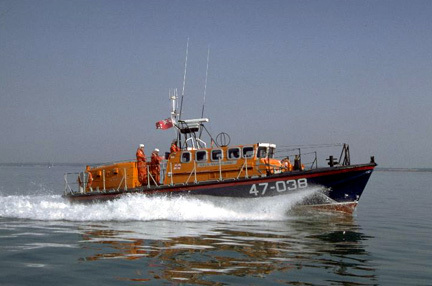 Meanwhile, an identical Tyne Class relief boat – the Sarah Emily Harrop 47 – 037 was at Fleetwood. She had a proud history having previously served at Lytham. After the Sarah Emily Harrop developed a problem and had to return to Holyhead, another relief boat – The Good Shepherd 47- 012 was brought to Fleetwood to await the return of our boat. Medal Record Thirteen medals have been awarded, 12 Silver and one Bronze, the last being voted in 1949. 1859 1859 Lifeboat house constructed at a cost of £175. 1860 Silver medals awarded to Captain Edward Wasey RN of the Coastguard and John Fox, coxswain of lifeboat, for putting off and rescuing after several attempts one man of the crew of the schooner Ann Mitchell of Montrose which was wrecked during a gale on 22 January. Silver Second-Service Clasp awarded to Captain Wasey RN for the rescue by lifeboat of four men of the schooner Catherine wrecked off Fleetwood in a gale and heavy snow squalls on 19 February. Silver Third-Service Clasp awarded to Captain Wasey RN for the rescue by lifeboat of the crew of 15 and a pilot from the barque Vermont of Halifax, stranded in a gale on Barnett’s Bank on 20 October. 1863 1863 Silver medals awarded to Mr W Swarbrick, Master of the Steam Tug Wyre and Mr Robert Gerrard, pilot for the rescue, by means of the Tug, of 17 persons from the barque Pudyona which had stranded in a gale and high seas in Morecambe Bay on 27 October 1862. 1879 In a heavy gale on 20 January the foundations of the lifeboat house were undermined and the house almost washed away. Lifeboat and carriage were got out with great difficulty. New lifeboat house erected at a cost of £162. 1881 Old lifeboat house sold to the owner of the site for £40. 1890 Silver medal awarded to Coxswain Robert Wright, who had held that office for twelve years and had been connected with the service, having been formerly one of the crew, for more than thirty years. Silver medals awarded to Mr James Fogg, Master of the fishing smack Osprey and Mr George Wilkinson, one of the crew, for their gallantry in attempting to save the lives of the crew of the schooner Jean Campbell on 7 November. 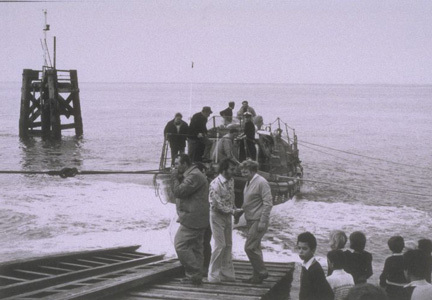 1892 Decided to remove present pulling lifeboat, leaving only one boat on the station. 1893 1893 Owing to the extension of the works of the Lancashire and Yorkshire and London and North Western Railway, it was necessary to construct a new lifeboat house and slipway at a cost of £1,630. 1895 Silver Second-Service Clasp awarded to Robert Wright on his retirement for his long and valuable service. 1901 Owing to difficulty of keeping slipway free of sand, a new site was obtained. The Railway Companies took down lifeboat house and re-erected it near the new slipway. 1941 Silver medals awarded to Coxswain Jeffrey Wright and Mechanic Sydney Hill for the rescue of the crew of eight of the schooner Stella Marie on 5 August in a strong gale and in high and very confused seas. The schooner had drifted on to a sandbank and was hard and fast on it. The seas were breaking right over her decks. Her crew of eight had been forced to climb into the rigging. It was difficult and very skilful rescue carried out with great dash and promptness, and the eight men were rescued only in the nick of time. 1945 Death of Head Launcher Wright attributed to injury received on service on 4 June. His widow was granted a pension by the Institution. 1948 Three keepers of the Wyre Lighthouse were rescued when the lighthouse was destroyed by fire. 1949 Bronze medal awarded to Coxswain James Leadbetter for the rescue in a strong wind and heavy rain showers on 30 April, the crew of eight of the ketch Alpha. Six of the crew of the ketch later walked across the sands and returned to the vessel in spite of warnings. The vessel later went aground on another large sandbank and, for a second time, the crew were taken off. Both had been carried out with skill and speed. The second was the more difficult of the two and could not have been accomplished but for the coxswain’s and crew’s intimate knowledge of the sandbanks. 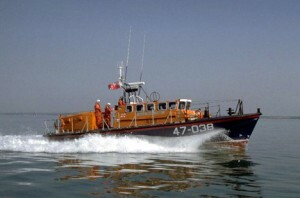 1966 D class lifeboat sent to station in May. 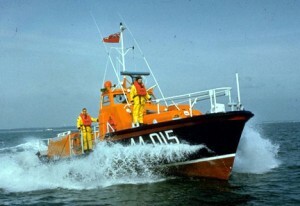 1976 The RNLI’s President, HRH The Duke of Kent, named the new lifeboat Lady of Lancashire on 20 July. 1984 Thanks of the Institution inscribed on Vellum was accorded to Second Coxswain Stephen James Musgrave, in recognition of his great skill and determination when the D class lifeboat rescued a man and recovered his sailboard after had had got into difficulties and was being blown out to sea 3½ miles south west of Fleetwood in a south-easterly gale and a rough sea on 23 March. 1985 The Ralph Glister Award for the most meritorious service carried out in 1984 by the crew of a lifeboat under 10 metres was awarded to Helmsman Stephen Musgrave and crew members Barrie Farmer and David Owen in recognition of the above service. 1987 Thanks of the Institution inscribed on Vellum accorded to Coxswain William Fairclough in recognition of his seamanship and boat handling skill when the relief lifeboat Arthur and Blanche Harris rescued the crew of two from the sinking fishing vessel Galilean on the night of 14/15 September.